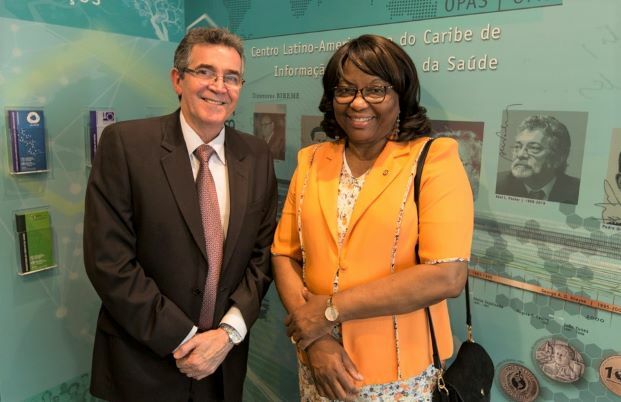 Dr. Carissa F. Etienne, Director of the Pan American Health Organization/World Health Organization (PAHO/WHO), visited BIREME’s new facilities for the first time on December 3, 2018. During the occasion, she participated at the IV Session of the Center’s Scientific Committee (SC). Her agenda continued on the 4th, as she closed the VII Regional Coordination Meeting of the Virtual Health Library (VHL7) and inaugurated the 10th edition of the Regional Congress on Health Sciences Information (CRICS10). During the IV Session of the Scientific Committee, Dr. Etienne was able to listen to comments and recommendations from expert members of the Committee on the results achieved by BIREME in 2018. Considering the presentations, the experts were unanimous in affirming how impressed they were by the development and achievement of the recommendations elaborated in the previous session of the Scientific Committee. Dr. Etienne pointed out that BIREME has grown stronger in the past years, also due to the contributions and recommendations of its Governance Committees, and she hopes that PAHO will be able to exchange increasingly with the experts that compose these committees. Moreover, the Director stated that “BIREME can support the transformation of health evidence into simplified information, which is an essential ingredient for decision-making in health”. On the central topic of CRICS10, whose scientific program was also supported by members of the Scientific Committee, Dr. Etienne declared that “today, more than ever, information plays a key role in achieving the 2030 Agenda and generating new programs and policies towards health and well-being for all”. At the end of the Scientific Committee meeting, the Director was able to visit the premises of BIREME and to converse with collaborators, thus being informed in more detail about the areas that compose the Center, as well as on its innovative projects, products and services in scientific and technical health information. Dr. Diego González, Director of BIREME, presented BIREME’s Historical Mural, inaugurated in February 2017, for the Center’s 50th Anniversary. Afterwards, each manager presented their field and the Director was able to converse with collaborators. Finally, Dr. Etienne met with all the employees, noting that knowledge and evidence allow the Organization to broaden its response in the fight against disease and to guarantee well-being for all. She also pointed out that the complex situation the Region faces currently may put at risk the achievement of public health goals. “BIREME’s work can provide valuable solutions for filling knowledge gaps and help make complex decisions in all fields”, she stated. According to Dr. Etienne, BIREME “is prepared for playing a relevant role in supporting innovation and digital health, information and knowledge use, development of policies and decisions based on evidence and scientific research, in order to attain the sustainable development objectives and universal health”. At the occasion, Dr. Etienne congratulated BIREME for having received the Outstanding Team Award, and emphasized the importance of balancing professional and personal activities and of family life and the maintenance of social relations for individual and collective well-being. The visit to BIREME premises ended with a social activity, during which the Director was able to in with interact with the Center’s employees in a more relaxed environment.